The coastal city of Jaco in the county of Garabito, Puntarenas province, on the pacific coast if only 1 hour from San Jose by car. Life is a beach here in Jaco. Hotels, vaction rentals, nightclubs, casinos, discos, beach bars and numerous restaurants are sure to keep you entertained. Did we mention the fantastic surfing? The waves are consistent, big and with great breaks. 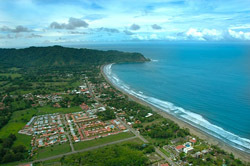 There is a yearly international surfing contest held at nearby Playa Hermosa. Accommodations for every budget and plenty of things to do like horseback riding, sea kayaking and sport fishing.